It wouldn’t feel like spring if I didn’t pull out another pair of floral print pants! I think all I really needed was some nice warm weather to bring this side out of me again. While florals are not a groundbreaking print this time of year, they definitely are still so much fun to wear. I love their femininity and the many different ways that they can be styled. With a pair of statement pants like these, I didn’t want to do too much to the outfit. I could not resist these hot pink shoes though and think they made a killer combo! I did tone down the rest of the outfit with a simple white button up and also added in this studded bag for some edge. What are some of your favorite ways to florals? A white button down is always to go, you make this outfit look so fresh! I love florals but afraid it may make me look bigger, but you have the perfect fit! Love it! 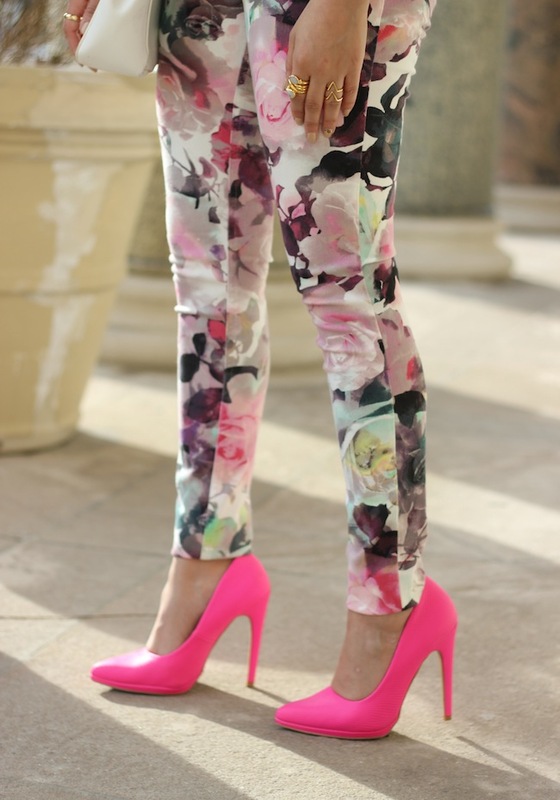 Those pink heels are too cute! I can't get over those hot pink shoes. What a fabulous outfit.